So why are we still stuck with dirty and expensive energy? Because big oil spends hundreds of millions of dollars to block clean energy. Instead, ABC aired Chevron commercials during the debate. Sort of speaks for itself, doesn’t it? Call it confirmation bias, but I take this as a bad sign for the enviroment. Are we completely powerless here? Probably not. One could take a moment to digg the story, and perhaps also to add your name to the letter that the We Campaign is sending to ABC. They’re hoping to get 100,000 signatures, which seems a very reasonable number. I wonder if they’re going to print them all out and hand deliver that stack of paper… and then smack someone with it. Sadly, this would probably not help them in their actual goal, which is to get the ad aired during next debate. This may be difficult, because Chevron no doubt has an even bigger stack of paper. 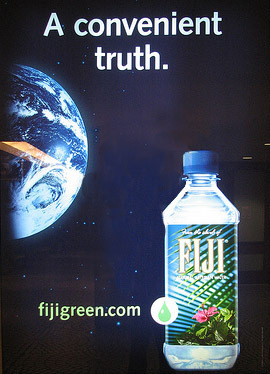 Water shipped from Fiji is being advertised as environmentally friendly. Wow. One sustainability blogger estimates that the total amount of water used to produce and deliver a single one liter bottle of imported water is 6.74 liters, and 250 grams of greenhouse gases are released. There’s really no way around the fact that shipping water across the ocean in small plastic bottles is just a much dumber idea than getting it locally through pipes. It pisses me off that there is a huge body of very important information that most people can’t get at. I’m not talking about books, the poor paper things, but the world’s academic and scientific journals, which are already online. Most people don’t even know that the world’s academic journals exist, but this is the master record, the huge source that all those science blogs and mis-representative popular articles draw from. These research journals are the collective output of every professional researcher in the world, in all subjects — only you’re not allowed to read them. Scott McClellan was the White House press secretary from July 2003 to April 2006, and the deputy press secretary before that. I saw him speak at a meeting of the Commonwealth Club this Tuesday, June 24. He talked about his relationship to President Bush, the administration’s “mistakes”, and why these mistakes were made. For example, he now feels that “the war in Iraq was not absolutely necessary.” It is fascinating to watch someone formerly so close to the president recant so publicly and dramatically, especially someone who appeared on CNN time and time again to justify the president’s decisions. The personal dynamics of what happened between the president and his press secretary are at least as interesting as the actual events, and perhaps give us a little bit of insight into the psychology of politics in America. The Exxon ad on CNN this morning talked about “using advanced technology to find new sources of oil.” The four-page Shell spread in the current issue of Wired – a high-tech, futurist magazine – proclaims “our scientists feel free to break rules that say providing energy could mean impacting our environment,” then goes on to discuss their technology for converting natural gas to liquid fuel. According to their website, Chevron invested $20 billion dollars in 2007 to develop new sources of oil and gas, compared to just $2.5 billion to develop alternative energy sources in the three year period of 2007-2009. 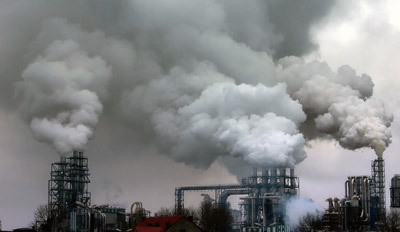 Am I the only one who thinks it’s insane that the energy companies are still trying to convince us that using more fossil fuels is a good idea?